One of my Facebook friends died from a heart attack last week. Although he was a virtual friend my sadness was real. We know what causes heart attacks and we know how to prevent them. Yet, every 34 seconds someone in the US has a heart attack, and every 83 seconds someone will die of one. The pain, suffering, and grief associated with these grim statistics are entirely preventable. No one should ever die of a heart attack! Heart attacks are caused by atherosclerosis also known as clogged arteries. When you have atherosclerosis your arteries are clogged by cholesterol-filled fatty pustules and abscesses called plaques. Over time, scars form under the abscesses and the arteries harden with fibrous scar tissue. Narrowed arteries increases the pressure needed to circulate blood. When one of the abscesses rupture, pus and blood spill out. If a clot forms it can block blood flow to the heart. When heart muscles cannot get enough blood the cells begin to die. If the area of dead heart muscle cells is large enough, your heart will not be able to beat normally. If your heart does not beat normally it cannot send blood with oxygen and nutrients to your body. If your body and brain does not get enough blood, you will die. The fatty abscesses that clog your arteries are caused by eating cholesterol-containing foods – meat, chicken, fish, milk, cheese, butter and eggs. We’ve known this since 1913 when Russian pathologists fed cholesterol from egg yolks to rabbits and produced atherosclerosis in their arteries. Nothing else that we normally eat causes atherosclerosis. Saturated fat usually travels with cholesterol, but it does not clog rabbit or human arteries. A- Coronary angiogram of clogged arteries before study. 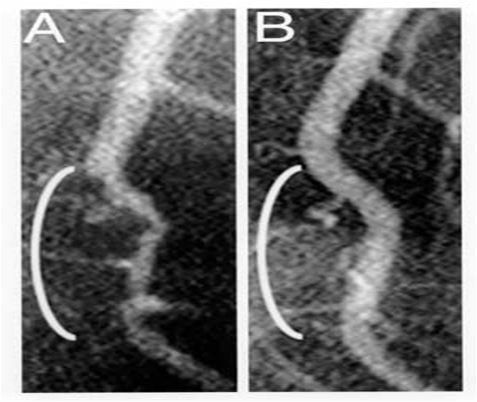 B- Coronary angiogram after 32 weeks on a cholesterol-free diet. Cholesterol in the diet may activate the inflammation that leads to atherosclerosis. This is an area of active research but we know with certainty that when people stop eating cholesterol-containing foods the fatty buildup and pustules on their arteries clear up and their arteries become unclogged. If a picture is worth 1000 words, look at the “before” and “after” images on the right from Dr. Caldwell Esselstyn, these images say it all. This is new information for many people and it conflicts with their beliefs about food and how they currently eat. When new information conflicts with our beliefs the first reaction is to reject the new information and seek out information that confirms what we currently believe. As a result the internet is rife with cholesterol-atherosclerosis misinformation. If you look at the Wikipedia page on atherosclerosis, you will see a confusing list of “risk factors” in the Causes section. According to Dr. William Roberts, Executive Director of Baylor University’s Heart and Vascular Institute and Editor in Chief of The American Journal of Cardiology, NONE of those things CAUSE atherosclerosis. The only cause of artery-clogging atherosclerosis is cholesterol in the diet. Sugar and carbohydrates do not cause atherosclerosis. The more cakes and cookies you eat the more atherosclerosis you will have because the cholesterol in butter and eggs clogs your arteries, not the “added sugar.” Refined sugar should be avoided because it has no nutrients. Fruits and vegetables are loaded with fiber and nutrients, they do not contain cholesterol and do not clog your arteries. Trans fats do not clog your arteries. They may contribute to the effects of cholesterol but the problem is cholesterol. Animal products contain trans fats and they are created by processing oils to make solid fats such as margarine. Avoid trans fats because they have no nutrients, not because they clog your arteries. Obesity does not clog arteries and weight loss does not unclog arteries. In fact, losing weight on a high cholesterol/high animal protein/low carb diet actually causes atherosclerosis. We all know skinny people who have had heart attacks. If you focus on unclogging your arteries with a cholesterol-free whole food plant-based diet, healthy weight loss will be a welcome bonus. Physical activity has many health benefits, but lack of exercise does not clog arteries, and exercise does not unclog them. We all know fit people who have had heart attacks. Smoking does not clog arteries, but if you smoke you should quit. If your arteries are already clogged, smoking makes a bad situation worse. Stress can constrict and narrow your arteries, but it does not clog them. The high cholesterol comfort foods that we tend to eat under stress will clog arteries but not stress itself. If your arteries are already clogged stress can make a bad situation worse. Reducing stress improves your quality of life, but it will not unclog your arteries. You have to change your eating habits. That is it, it’s not complicated. The only thing you have to do to prevent a heart attack is to stop eating cholesterol containing foods. Yes, your body does needs cholesterol, but you make all the cholesterol that your body needs. Your blood cholesterol levels are a combination of what you eat and what your body makes. When you stop eating cholesterol containing foods your blood cholesterol levels will drop and your arteries will begin to heal and become unclogged. You can also reduce your blood cholesterol levels with medications. Statin medications block cholesterol production by your body. These medications will lower blood cholesterol levels but the effect on reversing atherosclerosis is variable. High dose, long term statin treatment may decrease plaque volume. Statins may also stabilize plaques and prevent them from rupturing. The problem with high-dose, long-term treatment with any medication is side effects. FDA warns that statins may cause diabetes, memory loss and muscle damage. Discuss this with your doctor. If you are now wondering what you would eat if you did not eat any artery-clogging meat, chicken, fish, eggs, milk, butter or cheese for lunch, try this salad. It’s packed with nutrients and extremely easy to make.